When Carolina and Mico Rodriguez got a divorce, she didn't get mad. She got even in the kitchen. When Mi Cocina founder Mico Rodriguez was ousted in 2008 from M Crowd, the restaurant group he’d helped create, there seemed remarkably few repercussions. Despite the loss of their figurehead, M Crowd kept on trucking, business as usual. But were you seeking a crack in the fortress, you might find it in the being of one Carolina Galvan-Rodriguez, ex-wife of Mico. Handed an ample settlement in her divorce, she could have done any number of things: bought a pad on the beach, endowed a trust with her name on it, or just banked it. Instead, she took a more venturesome route. She ambitiously, almost obstinately, used some of her personal funds and gathered a few private investors and opened three new restaurants. She did it mostly because it’s what she knows, but also maybe because she had something to prove about herself and the role she played in Mi Cocina’s success. Though her journey since then has been rocky, the three restaurants she’s opened indicate that the role she played was greater than we realized. 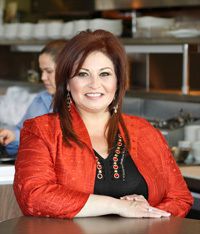 First, in mid-2009, she opened the eponymous Carolina’s Mexican Cuisine—two branches, one in Dallas and one in Plano. Then in December came a taqueria called Taco Mundo, situated in a remote strip center out by DFW Airport. She also had plans to open a second Taco Mundo in Dallas at Preston and Royal, but that location was derailed by construction delays, leading to a lawsuit with the landlord, unresolved as of March. But despite looming legal bills, she’s still managed to keep three places open with some fragile combination of duct tape and guts. Carolina’s is the more traditional venue, with a broader menu and cozy atmosphere. Taco Mundo is Taco Diner redux, with its bright, clean interior, hip attitude, and menu of Tex-Mex faves and taco plates. On food alone, she scores high marks. Among the M Crowd alumni she’s managed to woo are two original chefs. Tirzo Martinez, who was at Mi Cocina when it opened in 1991, oversees Carolina’s. Chef Hugo Cruz, formerly of Taco Diner, runs the kitchen at Taco Mundo. Some of the dishes they’re doing will certainly be familiar to Mi Co-ites. They also use fresh ingredients and make their own sauces and salsas, with an infusion of recipes from Carolina’s past. One of the best new items was sopes, offered at both Taco Mundo and Carolina’s. Like baby pizzas, but baked on the griddle, they had a corn masa crust topped with beans, lettuce, tomato, and a choice of shredded brisket, chicken, pork, or steak. The interplay of warm meat and cool lettuce and tomato refreshed. But the thing that stuck in the mind was the texture of the masa base: crisp on the bottom, yet satisfyingly moist and pliable. Taco Mundo offers sopes as an entrée, but they also came in a bite-size version as part of a fine sampler plate at Carolina’s. Along with those sopecitas was a crisped quesadilla, cut into quarters, filled with shredded brisket and melted cheese; taquitos enclosing tender white-meat chicken; house-made jalapeño poppers stuffed with cheese; and a chunky guacamole. Taco Mundo’s taco plates—four to an order at dinner, three at lunch—were straight out of the Taco Diner playbook. For dinner, you get your choice of brisket, marinated chicken, pork, tilapia, and rib-eye, which comes spooned into soft corn tortillas and served with guacamole, tinted rice, chopped onion, and fresh cilantro. One of the most flavorful selections was Tacos de Bistec with grilled Angus flank steak. Cut on the bias, the steak had an irresistible chewy-tender texture and a pronounced zip of flavor from the meat’s crusty edge, enhanced by a squeeze of lime. Carolina’s is where you put on the dog, where you can order bacon-wrapped shrimp over rice with grilled vegetables. Or steak, including beef Milanesa—a Mexican version of chicken-fried steak that came breaded and fried, served oh so elegantly with salad and French fries. Ceviche was letter-perfect. You can get it with shrimp, tilapia, or a combination of both. Combined with diced onion and bell pepper, the bits of seafood were marinated to an ideal gentle firmness and flavored with just the right notes of lime and salt. 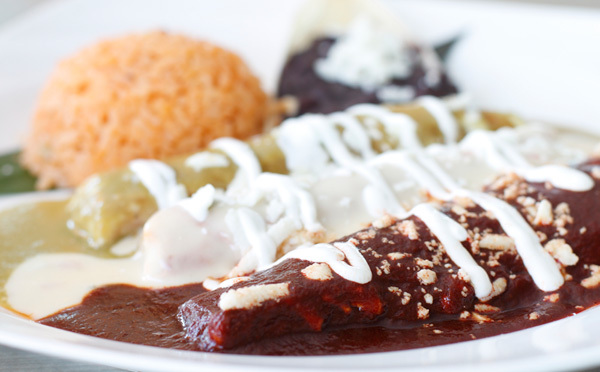 Mole fans will want to add Carolina’s to their list. Her mole sauce is so lush and creamy, you want to spoon it up like soup. It comes served with pretty standard dishes—ladled over boneless chicken breast or chicken enchiladas. Tinted rust, it had a moderate heat that warmed the mouth all over, but then got hotter if you touched your tongue to your lips. It was best with the enchiladas, ordered not with flour tortillas but corn, which absorbed the extra mole like industrious little sponges. Chiles rellenos, filled with your choice of ground beef, brisket, or cheese, was another staple dish that Carolina’s elevated via conscientious treatment. All filling options listed previously were good, but it was the pepper itself that made this dish memorable. The kitchen was careful not to overcook the large poblano, so it maintained some body and subtle heat. The contrast between its green vegetal texture and the richness of its battered egg shell was enough to make you forget about the beef filling altogether. Carolina’s boasts a swanky decor originally conceived by Zero 3, an M Crowd favorite (though the firm now distances from the project because it didn’t finish the job, a spokesman says, due to nonpayment). It incorporates natural materials, including stone, colored glass, ceramic tiles, and lots of wood. The Dallas branch combines amber-tone woods with black accents for a chic vibe, while the Plano branch feels like a rustic lodge, with expanses of wood that have been lovingly distressed. Tasteful touches like the abstract paintings on the walls keep it sophisticated. Taco Mundo’s interior is a stunner, with a mirrored globe at the entry, mod white molded-plastic furniture, and colorful Chihuly-esque glass vases. Cocktails were generously stiff, with two frozen margaritas: regular and La Bomba (aka the swirl). The locations could definitely be better. The Dallas Carolina’s may have one of the best patios to ever sit outside a Mexican restaurant, but the place feels hidden away in this northwest corner of Dallas. The Plano branch is up Central Expressway, in the old Mario’s Chiquita space, in a corridor that also includes competitors Chuy’s and Abuelo’s. And yet: Taco Mundo, far off the beaten path, has mobs at lunch because there is no competition in that neck of the woods. Galvan-Rodriguez has shown she can match Mi Cocina on food and atmosphere. With Mico gone, there’s even room to capture the Mi Cocina mystique. Is that a crack I see? $-$$. 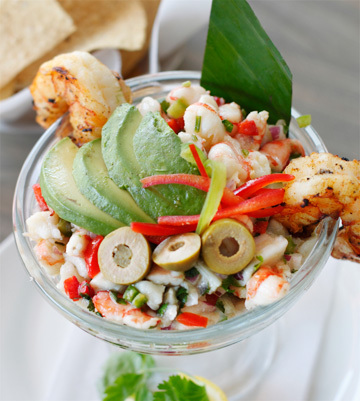 Get information for Carolina’s Mexican Cuisine. Get information for Taco Mundo.